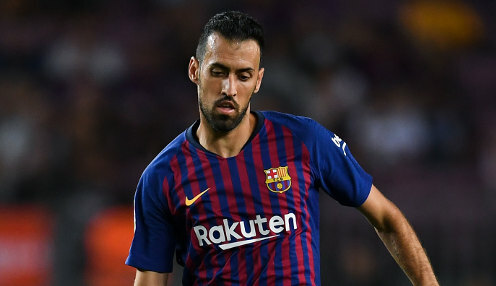 Barcelona midfield stalwart Sergio Busquets says he and his colleagues have to find an answer to their recent defensive frailties. The Blaugrana have not kept a clean sheet in their last four La Liga outings, suffering a shock 2-1 defeat at Leganes on Wednesday, having been held to a 2-2 draw at home to Girona at the weekend. We need to rediscover our defensive solidity. And Busquets has refused to place blame on any individuals, insisting that the Camp Nou squad need to work together to put things right. He told El Mundo Deportivo: "We are a team, we lose together as we win together. "When we lose we must analyse how the team lost, it is not down to individual mistakes, but all eleven players not performing as we should have. "We cannot speak about individuals and we should be focusing on conceding two quick goals and making it too easy for the opposition to win. "We could not create chances after falling behind, but the main concern is how many goals we are conceding - we need to rediscover our defensive solidity." In an evening of surprises in La Liga, Real Madrid also suffered a heavy defeat, going down 3-0 to Sevilla in the Mestalla, with Wissam Ben Yedder on the scoresheet to take his tally to six in his last three games. Despite their slips, Barca and Real remain in first and second places respectively in La Liga, with Atletico Madrid two points back in third. Barcelona are available at 1/5000 to retain their Spanish league crown this season, with Real priced at 2500/1 and Atleti 500/1.